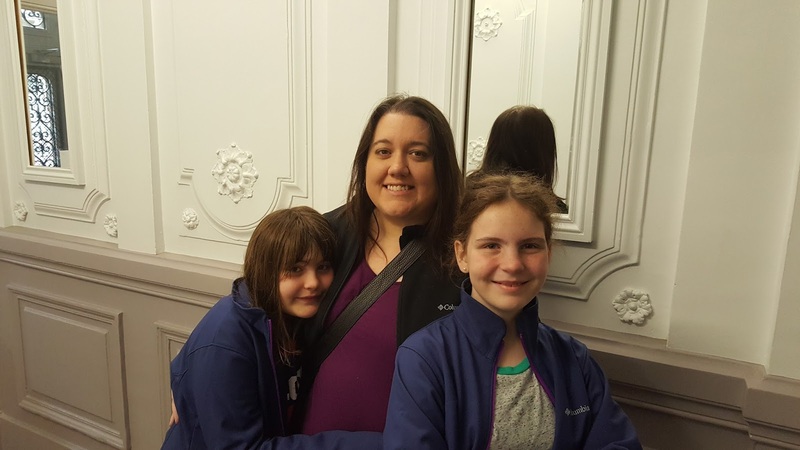 Last weekend we returned from our family vacation (+ my mom: grandma) that started in Boston and included stops in London and Paris and I wanted share our adventure with you. We left Boston at 10 PM and flew overnight to London. This was a first for all of us to plan to sleep on a plane. We flew in a 787 Dreamliner which I thought was pretty comfortable overall. Since we traveled via carry-on backpacks, everything was easily accessible. I managed to sleep off and on for a couple hours but it was definitely a long trip. We arrived in London at 830 AM and quickly had to make our way to the London St. Pancras train station to catch the Eurostar to Paris at noon. We took the Thameslink train to St. Pancras train station (about an hour ride) and made with with a hour or so to spare. At this point, we were pretty exhausted. We grabbed lunch/snacks at the Marks & Spencer gourmet food store and oh my goodness was this a cool place. I *wish* we had M&S in the states. We had pork pies, scones, pasta salad, crisps, pastries, and chocolates that we brought on to the Eurostar train for our two and a half hour ride to Paris. At this point, we were all ready to eat and sleep. In fact, I missed going through the tunnel under the English Channel because I was asleep. 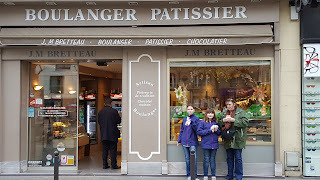 The next morning we ventured out for breakfast and hit up a pastry shop. Us girls on the trip basically lived for all the little pastry shops we encountered along the way. 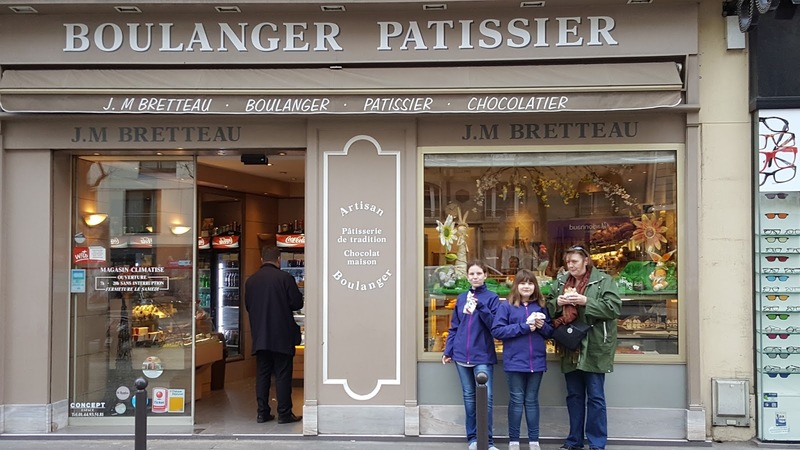 Chocolate croissants and eclairs were a big hit with everyone. We next made our way to the Eiffel Tower where we had already purchased tickets so we were able to walk right in opposed to waiting in the long line. Good thing because there were long lines to get to the top of the tower. It was slow moving but we eventually made it on a windy, chilly day. It was an amazing view but we were pretty chilly so it was a brisk visit at the top. After that we headed to grab some lunch and hit up a street vendor who was cooking fresh crepes. We had ham and cheese crepes while sitting on the edge of the Seine River. It felt like a movie moment.... After lunch we took a little cruise along the Seine River to see all the sites of Paris along the river. 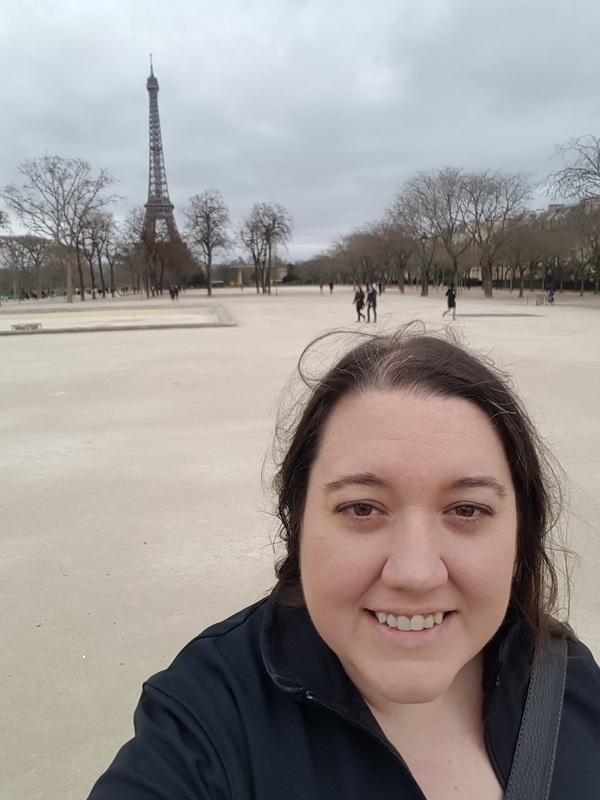 There was so much to see and after standing at the Eiffel Tower for so long it was nice to take a break. After we left the boat we hit up another street vendor selling waffles topped with nutella and strawberry... so so good. On our way back to our hotel, we did some shopping. We picked up little trinkets to remind ourselves of Paris. We also stopped and grabbed a few groceries -- fresh baguette, brie, butter, grapes, apricots, and pear. That evening we walked down the street from our hotel to another street vendor where we had sandwiches and savory crepes for dinner. The following morning, we had breakfast at our apartment and then headed out for a day of exploring. 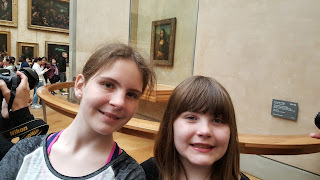 We started out at the Louvre which was amazing. I could have spent a week there. Knowing that we were limited on time, we prioritized the areas we wanted to see focusing on favorite artists and famous art pieces. Seeing the Monet in person was a highlight for the girls, especially my little artist Penny. She had decided she wants to be an Impressionist Painter and loves Claude Monet now. We grabbed lunch at the Louvre and then headed out to explore more of Paris. 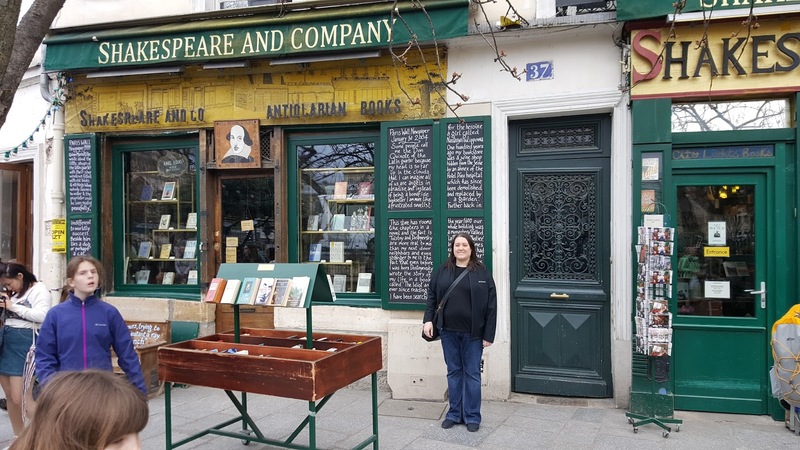 Shakespeare and Company has been a bucket list item for me forever and I wasn't about to leave Paris without making a visit. Shakespeare and Company is a bookstore that is famous for housing many famous writers as they traveled through Paris -- Allen Ginsberg, William Burroughs, Richard Wright, and so forth. Today it is one the biggest stops for book tours with many best selling authors stopping by for book signings. Notre Dame is just across the street from Shakespeare and Company so we ventured over to check it out. It is a beautiful building, far more intricate than in pictures. Next we started heading back to our apartment but not before grabbing dinner at a little corner cafe called Sarah Bernhardt named after a famous french actress. The next morning we had to get packed up to head to London back on the train. We took the Eurostar back to London and this time I was awake going through the Chunnel. Once we arrived back at the train station we did some shopping and grabbed another little gourmet lunch from Marks & Spencer. If you do nothing else on a trip to London, you have got to check out a Mark & Spencer Food Store.... We went into Kings Cross train station and was able to visit Platform 93/4 from Harry Potter. The girls were super excited and they have a pretty neat little store in the train station. Next we headed to the flat that we had rented in South Kensington. It was a big step up from our little Paris apartment with two big bedrooms, 2 bathrooms, a large living room and modern kitchen. The clean lines and style was perfect, I loved it. We did have a pretty stressful trip on the tube getting to our hotel as people were packed on like sardines and I worried we wouldn't all be able to get off the train in time but we somehow managed. After settling in we went to dinner and hit up an Italian restaurant just down the road. Afterward we stopped by a little grocery store and grabbed some groceries for the next day. The next morning we got up early and headed out on a chilly, rainy day for our tour taking us outside of London. 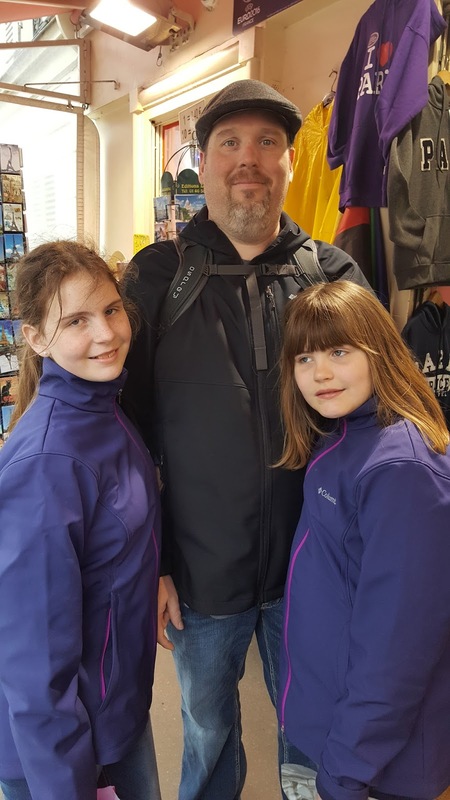 We started with a visit to Warwick Castle which was really neat. 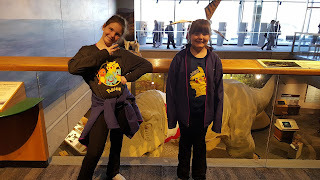 We had about an hour to walk around and the girls really loved it. 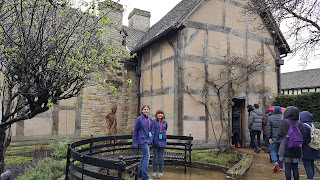 It was a bit difficult at times due to the rain but we had our compact umbrellas with us so were able to get around ok. Next we headed to Stratford upon Avon to visit the birth home of William Shakespeare. It was amazing to me how well it and so much memorabilia had been maintained. After our tour of the home we explored the town and fell in love with it. I could absolutely move there. We grabbed lunch from a sandwich shop (where I tried a Cornwall pastie - so good) and headed back to bus. Next we went for a ride through the Cotswolds which was beautiful. The grass was so green and lush and all the sheep and cottages made it feel like it was a out of a fairy tale. We arrived in Oxford later in the afternoon and did a tour of Oxford University which was very interesting. 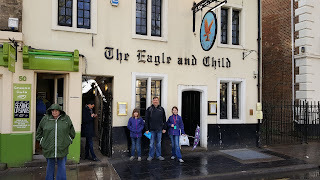 If had my way now, I would just move to the UK and go to Oxford instead of work... we also made a stop past The Eagle and Child Pub where JRR Tolkein and CS Lewis writer's group used to meet. Upon leaving Oxford, we got news that there was a terrorist attack in London so we were a bit nervous as to what this meant for our trip. 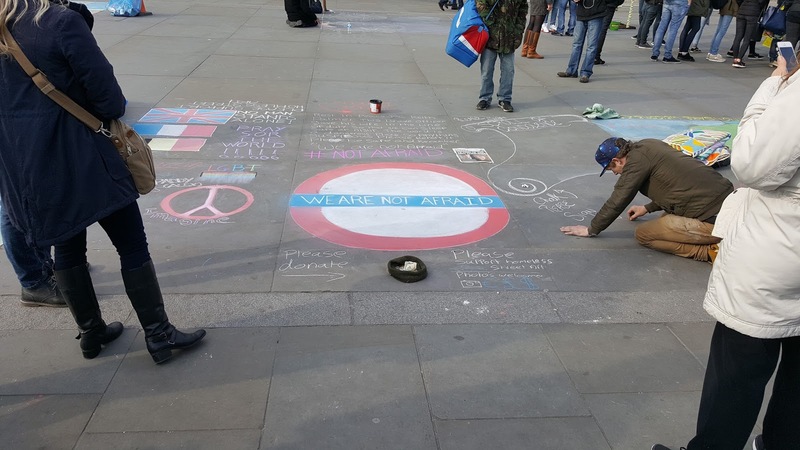 The tube station was shut down in some places. Luckily we were able to get to a stop not far from South Kensington. By that time though, we had been getting phone calls and text messages of people asking if we were ok. It was our luck to have decided to do the tour outside of London that day instead of the tour of London that was planned the following day or we could have been at Parliament when it happened. That evening we went to a local hamburger joint and then called it a day. 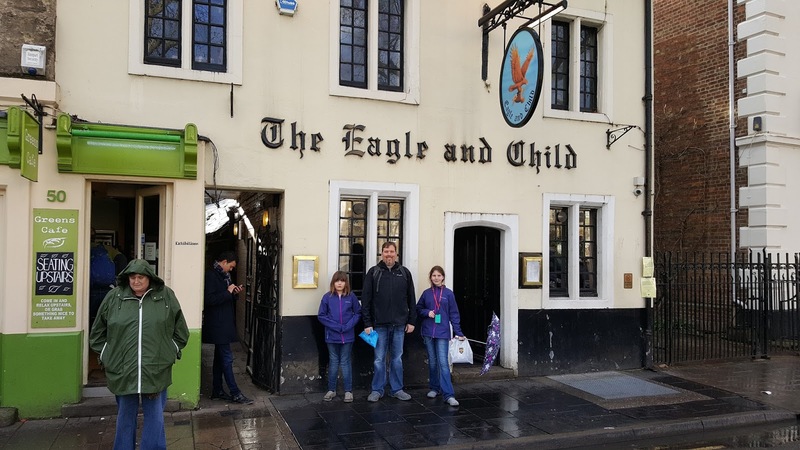 The next day we set out to explore London. We purchased a pass that gave us access via bus all around the city. Of course, due to the terrorist attack the prior day, many things were closed off but we made the best of the day that we could. 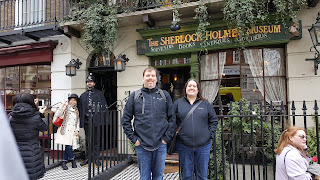 We started out at 221B Baker Street famous by Sir Arthur Conan Doyle's Sherlock Holmes. We did some shopping and I thought it was a really cool place. Next door was a Beatles store and we spent most of our souvenir money here... what can I say, even my kids are Beatles nuts... Grandma is too. 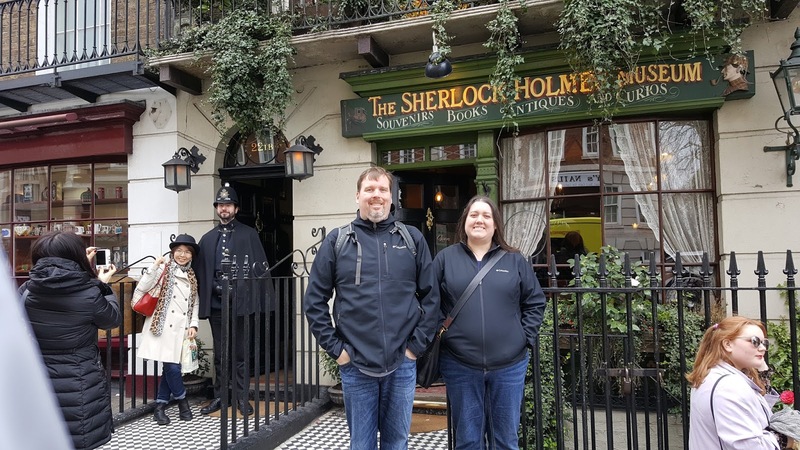 We had lunch at the Sherlock Holmes cafe where I got some fish and chips as customary to do in the UK. Next we took a tour around the city for awhile seeing the London Eye, Buckingham Palace, Trafalgar Square, etc. We stopped at the London Bridge and Tower of London for a bit. It was still very windy and cold so it was hard to stay outside very long. Traffic was especially bad due to part of the city being shut down and all the reporters who were there to cover the attack. I never thought in a million years we would be so close to a terrorist attack. I intentionally held back telling the girls until we were ending our time there because I didn't want them to be afraid. The city was still very positive though. In Trafalgar Square, there were artist doing drawings about peace and no fear. There was a guitar player singing John Lennon's "Imagine" and "Let It Be." If anything, this is an experience I will never forget and I was really moved to see how the city came out and came together. On our way back to our flat, we grabbed dinner at an Indian restaurant. All of my IT friends always rave to me that London has the best curry so I had to find out for myself as a curry-lover. Indeed, it was all wonderful. My girls, who can be a bit finicky, also liked it. The last day, we made our way back to the airport. Other than a brief panic over a cancelled train, we were able to get back to the airport with plenty of time. Going through Security was a bit overwhelming with the attack but security there was very kind compared to the US TSA. All of our bags were searched and swabbed. It took us about half an hour to get everyone together and ready to get go to our terminal. We left London at 4 PM and made it back to Boston at 7 PM on the same plane we came in on. Overall, this was an amazing trip with a lot of activity but such a positive experience. I would love to go again and hope to do so in the not so distant future. We loved backpacking and it is now our preferred method of travel, I plan to do a separate post soon on how we pulled it off.